Organic Mercury Poisoning is the accidental or intentional intake of compounds containing the chemical. What is Organic Mercury Poisoning? Organic Mercury Poisoning may be also referred to as Organic Mercury Toxicity. What are the Causes of Organic Mercury Poisoning? What are the Signs and Symptoms of Organic Mercury Poisoning? The signs and symptoms of Organic Mercury Poisoning can vary from one individual to another. It may be mild in some and severe in others. Several systems of the body may be affected. The poisoning may occur due to swallowing or inhalation of the compound. Children are severely affected from mercury poisoning than adults. Typically, with Organic Mercury Poisoning, the signs and symptoms are known to manifest over many years and decades. The sudden appearance of significant symptoms is not known to take place, unless a significant quantity of organic mercury compounds is ingested at once. In pregnant women, such a toxicity, especially occurring through eating mercury-contaminated fish, can be fatal for the developing fetus. How is First Aid administered for Organic Mercury Poisoning? Who should administer First Aid for Organic Mercury Poisoning? 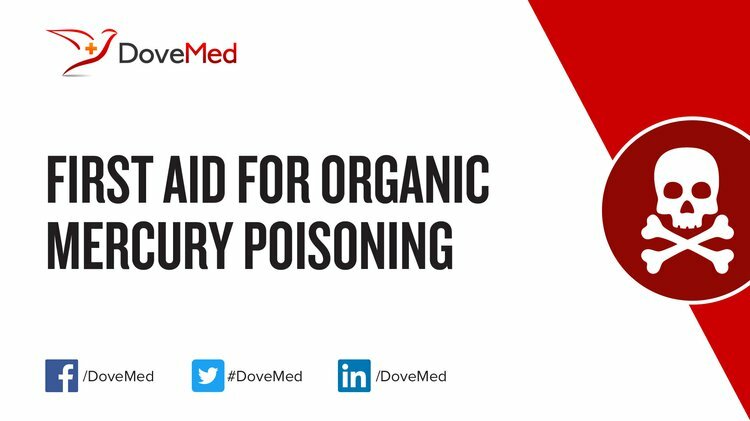 First aid for Organic Mercury Poisoning is administered by healthcare professionals. What is the Prognosis of Organic Mercury Poisoning? How can Organic Mercury Poisoning be Prevented? Karagas, M. R., Choi, A. L., Oken, E., Horvat, M., Schoeny, R., Kamai, E., ... & Korrick, S. (2012). Evidence on the human health effects of low-level methylmercury exposure. Environmental health perspectives, 120(6), 799. Zhang, H., Feng, X., Larssen, T., Qiu, G., & Vogt, R. D. (2010). In inland China, rice, rather than fish, is the major pathway for methylmercury exposure. Environmental Health Perspectives, 118(9), 1183. Ceccatelli, S., Daré, E., & Moors, M. (2010). Methylmercury-induced neurotoxicity and apoptosis. Chemico-biological interactions, 188(2), 301-308. Ralston, N. V., & Raymond, L. J. (2010). Dietary selenium's protective effects against methylmercury toxicity. Toxicology, 278(1), 112-123. Gardner, R. M., Nyland, J. F., & Silbergeld, E. K. (2010). Differential immunotoxic effects of inorganic and organic mercury species in vitro. Toxicology letters, 198(2), 182-190. Sheehan, M. C., Burke, T. A., Navas-Acien, A., Breysse, P. N., McGready, J., & Fox, M. A. (2014). Global methylmercury exposure from seafood consumption and risk of developmental neurotoxicity: a systematic review. Bulletin of the World Health Organization, 92(4), 254-269F. Ishitobi, H., Stern, S., Thurston, S. W., Zareba, G., Langdon, M., Gelein, R., & Weiss, B. (2010). Organic and inorganic mercury in neonatal rat brain after prenatal exposure to methylmercury and mercury vapor. Environmental health perspectives, 118(2), 242. Dórea, J. G., Farina, M., & Rocha, J. B. (2013). Toxicity of ethylmercury (and Thimerosal): a comparison with methylmercury. Journal of Applied toxicology, 33(8), 700-711. Boucher, O., Bastien, C. H., Saint-Amour, D., Dewailly, E., Ayotte, P., Jacobson, J. L., ... & Muckle, G. (2010). Prenatal exposure to methylmercury and PCBs affects distinct stages of information processing: an event-related potential study with Inuit children. Neurotoxicology, 31(4), 373-384.